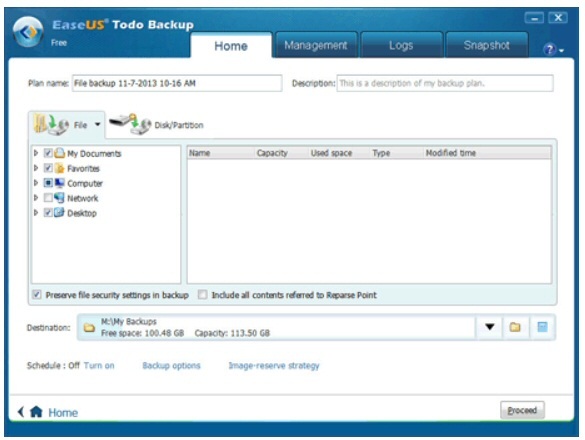 EaseUS Todo Backup Free, the best free backup solution for both business and home users, has been updated to version 12.0 and is now available for download from the official page. The newest version of Todo Backup features a new user interface and includes major features over previous versions. Windows 10 Compatible – allow to back up and restore your entire system state (operation system and installed applications) and all the data on Windows 10. 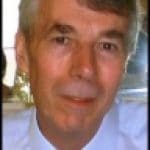 Multiple Languages Supported – English, Deutsch, Español, Français, Italiano and 日本語. Support for GPT (GUID Partition Table) Disk, and support for Exchange Server 2010 and later are the two major new features in this version. Other than these new features, this version also includes a number of fixes and improvements. While users who have used or have been using previous versions of Todo Backup will not notice major changes in this version (except the above mentioned features), new users who are switching from other free backup solutions will certainly find it as the best free backup solution. Fully support the latest Windows 10. Directly activate from trial/free version without re-download and reinstallation. Smaller installation file enables fast download and install. Improvement on automatic backup with better performance. 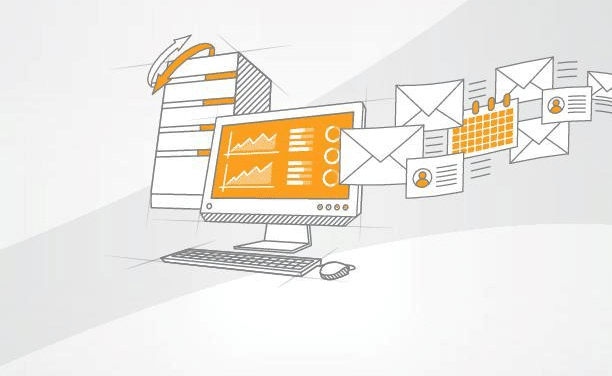 Satisfy smoother backup requirements of big data disk & partition. 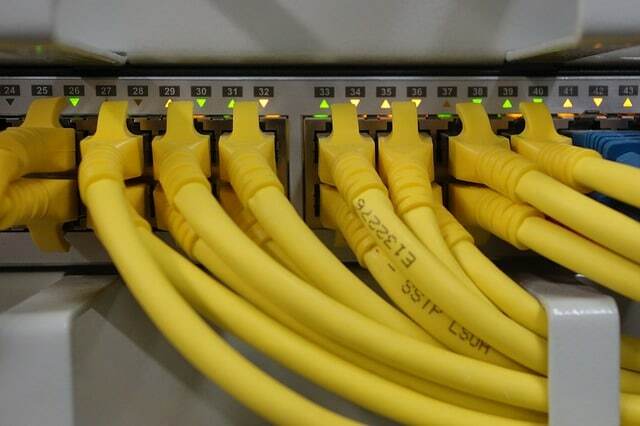 Greatly increase the stability of network files backup. Just like previous versions, version 12.0 also sports a clean tabbed user interface. The UI displays four tabs: Home, Management, Logs, and Upgrade. The Home tab contains common backup and recovery options such as data backup, system backup, disk clone, partition clone, file recovery, system recovery, wipe data, check image, convert image, and mount/unmount. 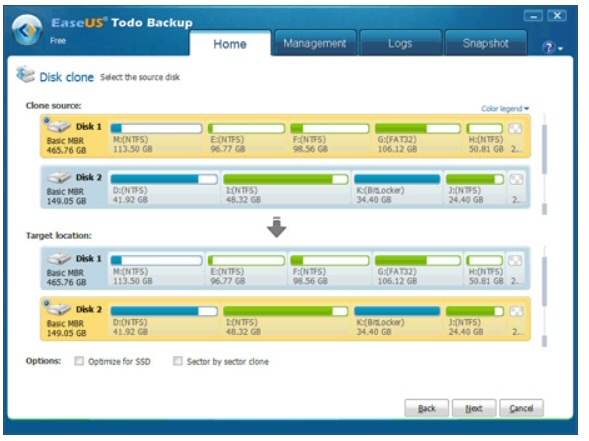 The management tab provides details on backups and also allows you manage previously created backups. Backup name, created time and date, status details can be found here. Options are also available to edit backup contents and location. You can also initiate new backups from here by clicking New Backup button. 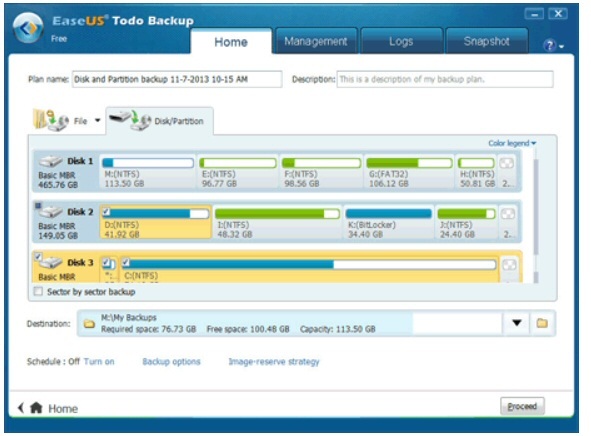 One-click system backup and recovery, backup network data, file and folder backup, scheduled backup, disk clone tool, disk and partition backup, email notifications of backup results are some of the core features of EaseUS Todo Backup.Unlike other free backup software, it can backup entire disk(s), GPT disk(s), partition(s), or dynamic volume(s) in a few mouse clicks. The inbuilt compression tool lets you select a compression level to save the disk space. Besides, you can also password protect your backup image file with 256 bit AEC encryption. One can also run Todo Backup without booting into Windows. Todo Backup lets you create a bootable media (USB, CD or DVD) so that the user can easily perform recovery in case of system crash. The Wipe Data option is another nice feature, which lets you completely erase sensitive data on a disk to protect privacy. The software packs-in all the important features that you would expect in a free backup solution. 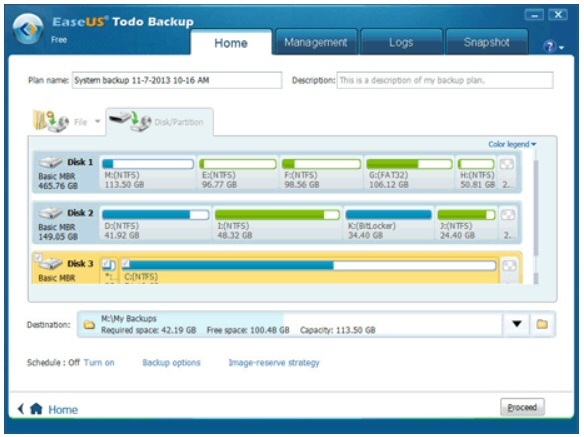 Todo Backup version 12.0 is compatible with Windows 2000, XP, Vista, Windows 7 and 8 and 10 operating systems.